The West Antarctic Ice Sheet, which holds enough water to raise global seas by several feet, is thinning. Scientists have been warning of its collapse, based on theories, but with few firm predictions or timelines. University of Washington researchers used detailed topography maps and computer modeling to show that the collapse appears to have already begun. The fast-moving Thwaites Glacier will likely disappear in a matter of centuries, researchers say, raising sea level by nearly 2 feet. That glacier also acts as a linchpin on the rest of the ice sheet, which contains enough ice to cause another 10 to 13 feet (3 to 4 meters) of global sea level rise. The study will be published on May 16 in Science. "There's been a lot of speculation about the stability of marine ice sheets, and many scientists suspected that this kind of behavior is under way," said Ian Joughin, a glaciologist at the UW's Applied Physics Laboratory. "This study provides a more quantitative idea of the rates at which the collapse could take place." The good news is that while the word "collapse" implies a sudden change, the fastest scenario is 200 years, and the longest is more than 1,000 years. The bad news is that such a collapse may be inevitable. "Previously, when we saw thinning we didn't necessarily know whether the glacier could slow down later, spontaneously or through some feedback," Joughin said. "In our model simulations it looks like all the feedbacks tend to point toward it actually accelerating over time; there's no real stabilizing mechanism we can see." Earlier warnings of collapse had been based on a simplified model of ice sitting in an inward-sloping basin. The topography around Antarctica, however, is complex. The new study used airborne radar, developed at the University of Kansas with funding from the National Science Foundation, to image through the thick ice and map the topography of the underlying bedrock, whose shape controls the ice sheet's long-term stability. The mapping was done as part of NASA's Operation IceBridge, and included other instruments to measure the height of the ice sheet's rapidly thinning surface. In some places Thwaites Glacier has been losing tens of feet, or several meters, of elevation per year. UW researchers combined that data with their own satellite measurements of ice surface speeds. Their computer model was able to reproduce the glacier's ice loss during the past 18 years, and they ran the model forward under different amounts of ocean-driven melting. The place where the glacier meets land, the grounding line, now sits on a shallower ridge with a depth of about 2,000 feet (600 meters). Results show that as the ice edge retreats into the deeper part of the bay, the ice face will become steeper and, like a towering pile of sand, the fluid glacier will become less stable and collapse out toward the sea. "Once it really gets past this shallow part, it's going to start to lose ice very rapidly," Joughin said. The study considered future scenarios using faster or slower melt rates depending on the amount of future warming. The fastest melt rate led to the early stages lasting 200 years, after which the rapid-stage collapse began. 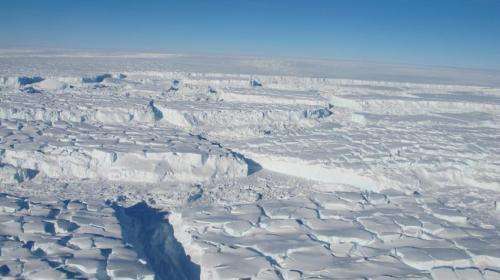 The slowest melt rate kept most of the ice for more than a millennium before the onset of rapid collapse. The most likely scenarios may be between 200 and 500 years, Joughin said. "All of our simulations show it will retreat at less than a millimeter of sea level rise per year for a couple of hundred years, and then, boom, it just starts to really go," Joughin said. Researchers did not model the more chaotic rapid collapse, but the remaining ice is expected to disappear within a few decades. The thinning of the ice in recent decades is most likely related to climate change, Joughin said. More emissions would lead to more melting and faster collapse, but other factors make it hard to predict how much time we could buy under different scenarios. More information: "Marine Ice Sheet Collapse Potentially Underway for the Thwaites Glacier Basin, West Antarctica," by I. Joughin et al. Science, 2014. In the meantime, antarctic sea ice is increasing. Being a Chicken Little pays the bills for a lot of government school graduates. Atmospheric CO2 get absorbed into plants, where it is then processed into carbohydrates (such as sugar), releasing the O into the atmosphere. The plant dies, carbohydrates enter the ground were they degrade chemically into simpler hydrocarbons, like octane (8 carbon atoms surrounded by hydrogen). Octane is burned in an engine where it is mixed with oxygen from the atmosphere, breaking apart that octane molecule into a bunch of CO2 molecules which are released back into the atmosphere. CO2 based climate change comes from a discrepancy in the amount of hydrocarbons being burned vs. the amount of CO2 being put back into the ground. If you wish to convince me otherwise, show me how that notion is incorrect. Sea walls for cities? Storm-proofing houses? Indoor farming? Increased desalination capacity? Freshwater pipelines or tankers? This ice shelf is already floating. How is it supposed to raise sea levels if it breaks off or melts? Try learning the difference between annual sea-ice formation/melt and permanent ice sheet melt. Because it's flowing off the land. Do I have to run subtitles for cognitively challenged? Consult the southern hemisphere map and witness that sea ice is formed in the southern ocean, while ice shelves are located further south in the polar region. Do you seriously suggest that sea ice is growing in the region with warmer temperature, while ice shelves are melting at the Antarctic continent itself? Adaptation is where this has to go. Sea walls? Yes. Storm-proofing? Yes. Indoor (moisture control) farming? Yes. Desalination? Yes. Freshwater pipelines? Yes. All of that and everything else that can be done. The world will get warmer, it is beyond our control. Definitely we have to adapt. The change is coming and 10-20ft of sea level rise will effect billions of people. While it's true it's getting warmer and will do so beyond our control. What we do control is how MUCH warmer. CO2 at 400pm, CO2 at 500ppm and CO2 at 800ppm yield very different upper bound conditions. We control how much more CO2 we put in the atmosphere just like we controlled how much CFCs we put in the atmosphere. Nations and corporations came together and agreed to replace CFCs and reduce their use, the ozone hole is still a problem but we're not making it worse, like we were. Same option here for CO2. Hey Tengiri, se how Baconbits posted that 4 times? That was for you, as you apparently need things explained to you over and over. And over....ad infinatum, ad nauseum. You guys can't be serious. A trivial mistake by a poster hailed like great achievement?? If nothing else, posting the same thing over an over again, would dilute the argument and insult readers intelligence. I'm talking about the story about dangerous melt of West Antarctic, not that puny BaconBits piece. Take a look at these graphs showing Antarctic and Arctic ice loss over time. Are you just argumentative by nature or do you always just toss off ideas from the top of your head without even thinking about what you're saying?!? Utter nonsense, BaconBits. More like 10 inches by 2100 if current trends continue. The IPCC gives a range of 10 inches to 32 inches (2 ft 8 in) by 2100. There is no prediction of 10 to 20 feet. See IPCC Fifth Assessment (2014), Technical Summary, Table TS.1 (pg. 90). It should be noted that the IPCC bases its scenarios largely on computer generated global climate models, all of which have been shown to be overstated in the last decade. Utter nonsense, BaconBits. More like 10 inches by 2100 if current trends continue. IF current trends continue. As the article(and another also published here today) clearly indicate, current rates have just increased. Which ice (sea extent, volume, or ice shelves)? They are all measured with different methods, hence implying different level of confidence. The most reliable is sea ice extent. Indeed, satellite flies over, takes a snapshot, and software just counts white pixels. Granted the area can be covered with clouds, but those are normally not malicious, and move out of way in couple of days. Compare that to sea ice volume. For that you meed to measure ice thickness, and only recently we have a dedicated satellite for that (CryoSat). 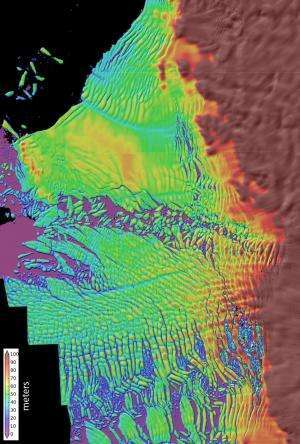 CryoSat will provide much more reliable estimate of sea ice volume dynamics. It is even worse for ice shelves. Their thickness is measured by gravitational method which is even less precise (robust). Until you confirm glassier ice loss by direct altimetery method, all the whining about glaciers melting is premature. As for CO2 at 400 ppm vs 500 ppm vs 800 ppm, BaconBits, the difference is negligible. CO2's heat-trapping capacity is a logarithmic function. It takes a doubling of CO2 saturation to raise temperature 1 C in a closed environment. If we assume pre-industrial CO2 was 280 ppm around the year 1880, that means, using simple math, that humans may raise global temperatures 1 C when it reaches 560 ppm. At the current rate, that will be around the year 2090. We've already experienced approximately 0.8 C of warming in the 135 years since 1880, so it's possible we'll experience another 0.2 C or so in the next 75 years; pretty close to what the math says minus all the arbitrary "forcings" and "feedbacks" built into the global climate models. That means that it will take until the year 2200 to reach 800 ppm (and another 0.3 C); however, global population is predicted to start declining in about 50 years. With that and more efficient energy production, we'll likely never reach 800 ppm. FYI, glacier mass loss does not automatically equal sea level rise. And glacier mass loss in remote regions like Antarctica is difficult to measure. So, the measurement that everyone worries about is sea level rise. Regardless of what anyone says about glacier mass loss accelerating, the number that matters is sea level rise. It is not accelerating. This is another issue rarely criticized in climate discussions. Which is easier to measure: change, or rate of change? Let's invoke some elementary fact from undergraduate calculus class. To estimate second derivative you need to measure at least 3 points on the curve [compared to just 2 for the first derivative]. So if you have a graph with 15 points or so [and huge error bars], your guesswork of "the rate of change" is just pure speculation. All that noise in the news about "accelerated" glassier lost is just baseless propaganda. TegiriNenashi Desperately needs to get a grounding in Physics & Mathematics. Especially TegiriNenashi, needs to understand the Significant difference between MASS & AREA and this includes understanding VOLUME as snow is far less DENSE than ice. Seeing the word dense & TegiriNenashi in my posting does make me wonder what TegiriNenashi's basic education actually is ? And how to read/interpret graphical/statistical data ? "All of our simulations show it will retreat at less than a millimeter of sea level rise per year for a couple of hundred years, and then, boom, it just starts to really go," Joughin said." That's in addition to the sea level rise quantified in your links. That data also doesn't account for accelerating loss from North and East Antarctica, either. And the assumption at this point is that these rates will remain constant, which is unlikely to be the case --most likely they will continue to increase. So already your talking point, outdated data can be thrown out the window. Additionally, these ice loss scenarios are all pretty much positive feedbacks, very sensitive to further warming and sea-level rise. How you can continue to insist that all of this will result in a sea level rise of 10-20 ft over a timespan of 2,000 years is simply beyond understanding, unless we conclude that you are an antiscience denialist troll. Then it all makes profound and perfect sense. If all of this is correct, we will be fine from this, even with the 1m becomes 6m over 300 years scenario. Why? Because at almost any growth rate, we will have the engineering resources to move cities or build dikes for very little present value $. See what Richard Tol has to say about this. So science is bad within your tea party mind? No wonder you're going to lose. The reality is the land ice is melting, no matter what the sea ice does. Do you seriously suggest that sea ice is growing in the region with warmer temperature, while ice shelves are melting at the Antarctic continent itself? You need to apply scientific thought my friend rather than come up with "Uh if it's warming how can ice be forming?" sea-ice is forming around the continent in winter, and growing as land/shelf ice melts more (due warmer temps - air & sea) during summer. This coupled with stronger/less convergent winds into the continent blows it further afield. It is less thick as a result BTW. As I said there are other things involved with the formation of sea-ice - salinity and wind blow. It's the same science free zone that equates more snow with cooling. Think about that too or Google anyway as that doesn't scan either. It's called irony in England ... except I'd not have explained it.
. . . however, global population is predicted to start declining in about 50 years. With that and more efficient energy production, we'll likely never reach 800 ppm. Global population as a function of what? CO2 production is determined by population? People will use less energy (to the extent less CO2 will be produced) in the future? Sounds like wishful thinking. How about some math? Well, in this case I will have to believe it!!! I know how to calculate derivatives of functions, but it's the first time I read this Law of the Three Points. Could you provide an example? If it's not asking too much, could you explain what a glassier is? I think he mean the glazier. That's the Skippy that fix your window when the little-skippys next door chuck their baseball through it by accident. That paper is from 1978. They are predicting the future. At that time CO2 was approximately 375ppm and it has increased since then. When these ice sheets melt, it is not going to be slow. How long did it take the North American ice sheets to melt after the last ice age? The ice sheets are not melting from the top down but from the bottom up due to tropical water circulation. Interesting times are coming. "I know how to calculate derivatives of functions, but it's the first time I read this Law of the Three Points. Could you provide an example?" Scroll down to "Differentiation and noise". Applied to subject at hand of "disintegrating" ice shelves, the confidence about mass loss is not that great. "Acceleration" is pure fantasy. "If it's not asking too much, could you explain what a glassier is?" Your case must be really desperate. Enjoy your little triumph. Whoa Mike. One step at a time. Calculus? Ha, I'd be amazed if he could spell it. My doctor told me 36 years ago that chain smoking was going to kill me, but I'm still alive, so I guess by your thinking we can conclude that chain smoking doesn't cause cancer, and the doctor was wrong. Do you see a problem with that logic? A huge one is that humankind, at seven billion strong and counting, will continue on after I die, but we have only one chance to get it right when it comes to the planet. However otherwise valid your points may be, saying that because science 36 years ago was warning of a future problem that current science says is still two centuries away somehow invalidates the argument is simply absurd and intellectually dishonest. It makes me question anything else you say, regardless of your qualifications to say them or mine to understand and evaluate them. JH Mercer paper was very specific in its predictions. In fact he was so confident in polar amplification effect that he forecasted 5-10K temperature increase during next 50 years above 70th degrees latitude. So when scientific prediction doesn't withstand test of time what do we usually do with it? Do you think that because Fleischmann–Pons had good intentions (supplying world with unlimited energy) we should hail their result (or lack of thereof)? PhotonX, that is some of the best prose I have seen in a long time. I hope you write some more in the near future. Great job. That hits home. JH Mercer paper was very specific in its predictions. In fact he was so confident in polar amplification effect that he forecasted 5-10K temperature increase during next 50 years above 70th degrees latitude. No he did not! He said in 1978 that IF fossil fuel burning continued unabated then we could see a doubling of atmospheric CO2 in ABOUT 50 years and that this, in turn, could lead to a "much faster warming at latitudes above 80 degrees" that could cause the destabilization of the West Antarctic ice sheet "TO BEGIN" in as little as 50 years! Look at the record! We've had significantly more warming at higher latitudes, including the West Antarctic ice sheet, and we are seeing it is beginning to destabilize NOW, only 36 years after he made that prediction and a full 14 years SOONER then he predicted. You really are a piece of work Tenigi. A denialist to the core. So here we are, I've been telling you, deniers and AGW-ers, ecologists, greeners and pro-idustrialites alike for years on this forum and 30 years myself, that CO2 is only a secondary effect of burning fossil fuels. Well here we are with the primary. You two camps have been fighting over negligible and arguable rises in temperature and CO2, when you should have been looking to the poles. I can't blame you, it is what the media, academia and the world seemed to want. Let's keep an economy running to fuel fossil fuels: Profits and new cars, and laziness. Well now the people who own that coastal property are worried, and since they have the money, the truth is coming out. Funny how that works. So I will say again, it is the HEAT, not the temperature to the CO2 doing the damage. Heat added to the Earth's Hydrological system that causes the problem. Heat has raised the oceans 6cm so far. CO2 insulating the Earth is not really a problem if we turn turn down the thermostat. Wrong, it is the HEAT TRAPPED by CO2 in the atmosphere that is the problem. It is the fact that the CO2 is not allowing the planet to cool that is creating the TRAPPED HEAT that is raising the Earth's temperature. "So I will say again, it is the HEAT, not the temperature to the CO2 doing the damage. Heat added to the Earth's Hydrological system that causes the problem." Why don't you make simple calculation? Google "world energy production". Then check it up against heat allegedly trapped in the oceans. The discrepancy is about factor of 10. The same goes when comparing world energy (eventually dissipated as heat), compared to solar radiation trapped with greenhouse effect. However, with direct heat production, no matter what climate sensitivity might be, it is hard to argue that it is less than zero (no ice age for you). Why don't you do a simple calculation? From empirical data not some site. The actual change in the Earth energy state due to unresponsive morons. Nowhere in this article does it mention CO2. Even if you're right, you are still wrong. The primary effect is the ice. The PRIMARY effect is on water and ice. CO2 and temp. are secondary. Why do you care about how the heat melts the ice? 'Cause you've been whining about CO2 for so long is why. By the way, why is CO2 increasing when throughout history nature has had resources to sink more CO2 than man could produce? and what other mechanism would be behind those "theories" Alchey? Wrong, the PRIMARY effect is the increasing HEAT arising from the trapping effects of CO2. The warming oceans and melting ice are DERIVATIVE effects of this primary issue. Why do you care about how the heat melts the ice? Because it effects the means by which we can deal with the causes. 'Cause you've been whining about CO2 for so long is why. Because until recently the natural carbon cycle was more or less in balance. "Throughout history" mankind has not had the means to effect the natural cycle much (although there is recent evidence that forest clearing and agriculture may have been affecting climate more than was realized). That changed with the industrial revolution and the concurrent giant upsurge in the amount of CO2 we are putting into the atmosphere. The science is clear - we are overwhelming (or, probably more precisely, we have overwhelmed) the planets natural carbon cycle. What you point to is of great concern, to be sure, but it is not the mechanism responsible for the increasing CO2 levels. we would still be better off, far better, with twice as much CO2 in the atmosphere rather than half. Scientifically speaking of course. Dear lord, I hope you're just trolling... because that is actually the stupidest comment in this thread by a pretty large margin. Our rubbish dump, the infinite blue sky. Great overview Eric in Chicago. so you think 200 ppm or lower is a good idea? That is insane. Why would anyone advocate experimenting by changing the only atmosphere we have? Excellent point, Agomemnon. We should definitely not be aiming for 200 ppm CO2. It was foolish of anyone to even suggest such a thing... Wait, who other than you ever suggested it? Got any other great insights? @PinkElephant. Now that we can agree that 200ppm is ridiculously low and dangerous what is the 'correct' amount of CO2 in the atmosphere? Now that we can agree that 200ppm is ridiculously low and dangerous what is the 'correct' amount of CO2 in the atmosphere? 200 ppm is the natural low during the peaks of recent glaciations. 280 ppm seems to be the interglacial optimum. There isn't an iota of scientific analysis in your statement. What is the 'correct' level of CO2 in the atmosphere? Why is it the correct level? Show proof. When people provide you links in their posts, the general expectation is that you follow the link and familiarize yourself with what's being referenced. That particular link above shows you, among other things, a plot of CO2 concentration in the atmosphere over the last 400,000 years. The pre-industrial range within which that concentration has been oscillating, is by definition what's normal for Homo Sapiens and the climates/ecosystems/biota that support our civilization and house/feed/sustain our burgeoning global population. Additionally, tremendous quantities of resources have been sunk into modern cities and associated infrastructure as well as transportation networks - all of which are built on assumptions of sustainability and stability of recent climate patterns. It would be wise of us to not pull the rug out from under everything we've built around the globe, and not to pile even more stress upon our already unsustainably overexploited life support systems. 1)You assume that the CO2 levels at re-industrial and oscillations are optimal for earth and human life. Since plant life evolved with higher CO2 levels, and in fact work better in far higher concentrations than we have, why is that "off the table", as a net positive effect? With increased CO2 comes higher yields, faster growth and requires less water. Civilization is fed by higher concentration of CO2. Not the Earth; just human life. Earth doesn't care either way. We do. With increased CO2 comes higher yields, faster growth and requires less water. Civilization is fed by higher concentration of CO2. Increased CO2 will indeed bring a lot less water to some regions (causing desertification, which isn't conducive to agriculture), while bringing more downpours and flooding to other regions (and floods aren't exactly conducive to agriculture either.) Increased CO2 also acidifies the oceans, putting coral reefs and many plankton species under stress; this impacts marine food chains and can result in further depletion of seafood resources even beyond what's already happened due to chronic world-wide over-fishing and other pollution. I mentioned above the negative effects of acidification on ocean productivity, but there's yet another negative effect on top of that: warmer ocean waters are just generally less productive, with or without acidification. In general, compare the agricultural productivity of equatorial and tropical regions, with that of the temperate belts. You should realize the temperate zones are a lot more productive. Under AGW, the temperate belts move toward the poles. That is not so great for agricultural productivity, because there's less sunlight at higher latitudes, and the growing seasons there are shorter due to the fact that the winters are longer. In the meantime, a warming climate should eventually lead to warmer winters. Freezing of the soil keeps some of the worst pests (insects, for the most part) out of temperate zones. A warming climate means the Western countries will have to deal with all the pests and diseases that plague the tropical nations today. That's the agricultural side of things. Of course, there are many other sides. As I already mentioned before, population centers and infrastructure. Rising oceans won't exactly be cheap to deal with. Then there are the costs of general climate disruptions -- more droughts, more floods, etc. A warmer climate has more energy to throw around; even if frequency of storms doesn't increase, the storms themselves will be more severe on average. Then there are impacts on natural ecosystems. Under AGW the climate change is too quick for natural systems to adapt (compared to natural climate change, which proceeds at a far more *glacial* pace); this climate dislocation will result in mass extinctions. Huge and abrupt losses of biodiversity will have as-yet unknown and unpredictable effects on the rest of the biosphere. Besides, irretrievably losing so many species is a huge blow not only to science and tech, but to our natural heritage and wealth as inhabitants of this planet. Second you attribute an unscientific belief system in your catastrophic crisis warming. FACT: Increased CO2 increases the yeild, growth, and strenght of plant life. Their biological ideal is several times above current CO2 levels. Why are you attributing and concerned about warming when there hasn't been any and whatever has occured has been extremely minor and expected (as what does occur during interglacial periods)? There has been, I'm concerned because physics tells us its nature and its expected trajectory -- which is not good -- and the warming that's been happening lately and now is not any part of the normal glacial/interglacial cycle; it's also far more rapid than the natural Milankovitch climate change. Since plant life evolved with higher CO2 levels,.. why is that "off the table"
With increased CO2 comes higher yields, faster growth and requires less water. No. More CO2 requires more H2O - chemistry. Your ignorance Agomemnon & ease of being manipulated by propaganda knows no bounds ! Many food plants and potentially others, there is NO definitive evidence these plants, as they are now, evolved in atmospheres with high CO2 concentrations. Higher CO2 reduces some food plant growth & nutrition. Also some food plants shift equilibria away from food to protection producing cyanogens, that means cyanide when cooked or ingested ! This is already happening with Cassava in Africa, a staple food - people are getting exposed to cyanogens, it doesnt kill outright, starts by causing paralysis & symptoms like polio. The same occurs with clover, a staple food for livestock. ie. Higher CO2 can mean very big economic problems ! Great web site. Thanks for pointing it out.